Whether your water needs dangerous particulates removed or drinkable, but foul smelling – we can help. Water is a satisfying and healthy beverage. Encourage employees to drink more of it with water filtration services. We provide a number of different options from bottleless water coolers to countertop dispensers as well as different levels of filters. You can count on our staff to assist you in selecting just the right filtration system for your break room needs. All cleaning, maintenance and the filter changes are handled by us to ensure uninterrupted service 24 hours a day. Don’t forget that filtered water ensures coffee and tea has a superior taste as well. Get it all with water filtration service from the Southern California refreshment experts – Dependable Vending. Let our friendly and knowledgeable staff match the proper water filtration unit to the needs of your workplace. Eliminate heavy lifting with a water cooler that attaches directly to the water supply line. Save floor space with a water filtration unit that can be placed next to the coffee machine. 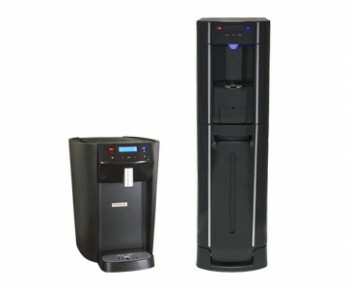 Make the water cooler a main feature in the break room with a stand-alone model. From new water filters to cups, we provide what you need to ensure refreshment 24/7. The same water dispenser can be used to provide water in two temperatures. Filtration eliminates the invisible particles that adversely affect the flavor of water. The water cooler remains a healthy beverage alternative to sweetened drinks. It’s a place for collaboration and refreshment. Hydrated employees think clearer and are more productive. Consider bottled water a must-have for your break room. Keep your glass half full with great tasting water from Dependable Vending at 800-785-3803, ext. 236 or email info@dependablevend.com.